The shirts are gender specific, dry wick and those registered noon April 3 are guaranteed a custom race shirt. After that, shirts be available while on line supplies last. Any extra shirts will be distributed after the race on a first come first serve basis. Everything you ever wanted to know about shirts can be found right here.. The FEMALE shirts run small! Opt out of a shirt and save $5.00. For every three registrations, we will refund $15.00 of your registration fee. Two ways to do it. At registration checkout, you will be given the option to share your registration on Facebook. If 3 people register from that post, shazam we will refund $15. On your registration receipt, there will be a registration link. Share that link and we will refund $15 for every 3 registrations. Over 90% of the race is through Nashotah Park's forests and past both Forest Lake and Grass Lake. The trails are wide and are groomed year round. The 5K is one loop, 10K two loops and half marathon is 2.5 loops. Overall Male & Female will receive medals. Top 3 male & female finishers in 5 year age groups will receive a custom medal. 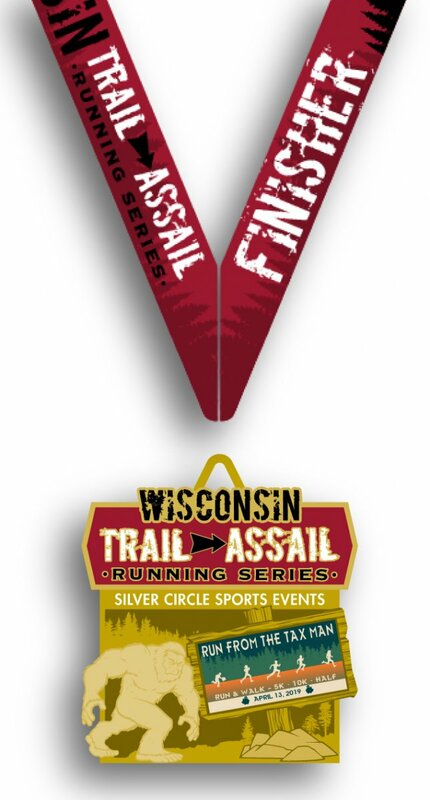 Half marathon finishers will receive a custom Wisconsin Trail Assail 1/2 marathon finishers medal. InStep Physical Therapy & Running Center was founded in 2003 by Tom Labisch and Bob Corby, both physical therapists, and John Ochsenwald, an athletic trainer. Their goal was to create a place where both athletes and non-athletes alike could come for physical therapy, injury treatment, rehabilitation, biomechanical evaluations, massage therapy, and custom orthotics; as well as a specialty running store where runners and walkers could be properly outfitted with the correct running & walking shoes, fitness apparel, and accessories. The best of both worlds, going beyond the shoe. Water and sports drinks are available on course and the finish line. Make sure you stop in an enjoy our free fresh fruit bar at the finish line. The shirts are gendar specific, dry wick and those registered the Friday on week prior to the race are guaranteed a custom race shirt. After that, shirts be available while on line supplies last. Any extra shirts will be distrubuted after the race on a first come first serve basis. The FEMALE shirts run small! We strongly encourage to pick up your packet prior to race day. The entrance to the park can get delayed and lines become long at packet pickup. Parking is available at picnic area 1, area 2 and along the road. Please do NOT park in the large breed dog run parking lot. You will be ticketed if you do. There is also a park and ride at the intersection of Hwy 16 & Hwy C on the north west corner. Consider parking there and carpooling to the event. Please do not walk from the park & ride as you will not be permitted to enter the park on foot. The lot will fill quickly so please following the park rangers directions for overflow parking. There is a $4.00 entry fee per car or you can purchase a Waukesha County Park annual sticker. For information about purchasing a ticket see the Waukesha County Parks website.